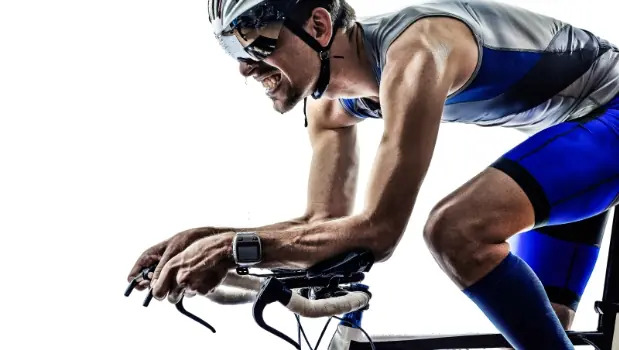 My athletes, both experienced veterans and novice alike, often express concern that their triathlete friends have recently undergone exercise testing to determine their V02 max or lactate threshold (LT). They ask me whether or not they should be tested too. I usually answer by asking another question; "Do you know what V02 max and LT actually measure?" Usually, they don't. V02 max and LT tests can be valuable tools used to train athletes to reach their maximum potential. But they have to be used correctly and responsibly. Adding these measures to your training regimen can be expensive with the cost of each test ranging from $100 to $300 per assessment. In order to make a responsible choice, it is important to have all the information. So let's start with a basic definition of each test. V02 max is defined as the maximal volume of oxygen that the body can deliver to the working muscles per minute. This is an excellent measure of physical fitness because it provides a metric of efficiency. So if we think about the body as a machine, the muscles collectively are the engine. Just like a car engine, the muscles require a constant delivery of fuel (carbs and fats) and oxygen (to aid in "burning" the fuel). One of the functions of blood is to transport the fuel and oxygen to the muscles. The heart acts as a fuel pump, sending oxygen and nutrient rich blood out to the tissues via arteries and bringing back CO2 and metabolic wastes via veins. So you can see that there are several components involved in the operation of the system. This is reflected in the equation for calculating V02 max. This looks much worse than it really is. HRmax is the maximal heart rate at peak exertion. It is measured as beats/minute. SVmax is the volume of blood pumped by the heart out to the muscles after each beat and is measured as liters/beat. If we multiply HRmax and SVmax we get maximal cardiac output (Qmax), measured as liters/minute of blood pumped out to the muscles. The last part of the equation is AOxy-VOxy. This is called the A/V oxygen difference and it is a measure of how much oxygen is taken out of the blood as it travels through the exercising muscles. The final unit for V02 max is liters of oxygen per minute. Aerobic exercise improves V02 max significantly. Interestingly, much of this improvement results from an increase in the size of the heart. So clearly, V02 max is a great measure of physical fitness. But it is a poor predictor of athletic performance. If you measured the V02 max of eight world-class cyclists before a race, you would be hard pressed to predict which of them would win if you only had their respective V02 max values. This is where the LT comes into the picture. Lactate threshold is defined as the intensity of exercise at which lactate begins to accumulate in the blood at a faster rate than it can be removed. This is problematic because as a result, unbuffered acid is added to the blood, a condition that makes you feel like you have to vomit and stop right away. So why does this happen during high intensity exercise? In order to answer this question, we need a basic description of why lactate is formed during metabolism. Lactate has gotten a bad rap for the past several decades. Many refer to it as a metabolic waste product (not really) and blame it for the muscle soreness that can plague us several days after a hard workout (not so, actually inflammation). Let's start by describing how we convert our carbs to energy. Our cells produce a molecule called ATP. The breakdown of ATP provides the energy needed to contract exercising muscles. We make ATP in a three-step process: Glycolysis, Krebs Cycle, and Electron Transport Chain (ETC). The products of Glycolysis feed into Krebs, which subsequently feeds its products into ETC. When one glucose molecule is broken down completely, a small amount of ATP is made during both Glycolysis and Krebs, but most of the ATP is generated at the end of ETC. The drawback is that ETC is much slower than Glycolysis. ETC is very effective at making enough ATP to sustain low to moderate intensity exercise. This article was originally published on usatriathlon.org. USA Triathlon is proud to serve as the national governing body for triathlon—the fastest growing sport in the world—as well as duathlon, aquathlon, aquabike, winter triathlon and paratriathlon in the United States. Visit usatriathlon.org.